American immigrant stories often start with the person’s life in the U.S., but gloss over the process of being admitted as an immigrant. Getting through the immigrant processing centers was stressful. There were language barriers, crowds, slow-moving lines, stringent medical and financial restrictions, and official questions that forced immigrants to guess what answers the officers wanted. Often, they guessed wrong. 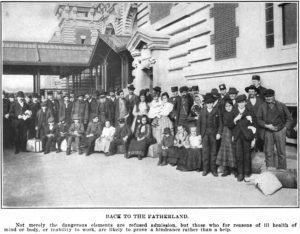 Today we’ll look at the personal experiences of some specific would-be immigrants, as reported in 1911 and 1912 by the U.S. Jewish newspaper La America. La America (New York), June 9, 1911, featuring the story of immigrant Gabriel Capelouto. Note the Yiddish text in the left column. 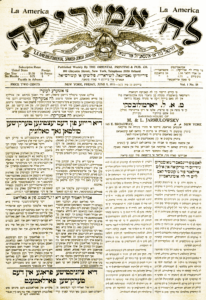 This Ladino-language paper briefly experimented with front-page Yiddish content to raise Ashkenazic Jews’ awareness of their Ottoman neighbors. When La America first wrote about Gabriel Capelouto of Bodrum, Turkey, he had been detained at Ellis Island for several weeks and was about to be deported. Capelouto had made the long journey from Turkey to Argentina. There he boarded a ship for New York (without his wife, Sinoru, or their two children) en route to Atlanta, where his wife’s brother, Reuben Galanti, was waiting for him. That’s when things started to go wrong. In Buenos Aires, people warned Capelouto to expect prejudice in the United States. They told him the U.S. government would turn him away if they learned he was a Jew. Acting on that bad advice, he repeatedly told officers at Ellis Island that he was a Muslim Turk. He assumed that in America, as in Turkey, Muslims had it easier than Jews. Then as now, religious profiling of immigrants worked in the opposite direction in the United States. During questioning, an officer asked him if Turkish law allowed Muslims to take more than one wife. Turkish law did allow that in those days, and Capelouto said so. He thought it was an unimportant answer to a casual question. He later learned he was being excluded from the country, with no explanation. Doctors examine new arrivals at a U.S. immigrant processing center, circa 1905. Note the Hebrew-alphabet eye chart. From an Underwood stereographic print at the Library of Congress. Not a day goes by without additional unpleasant cases involving our Turkish Jews at Ellis Island… because they did not know how to respond to immigration laws [when questioned by] the commission. Many are detained for weeks. Others, after sacrificing their money and a long voyage across the ocean, are turned away and thus cause ruin for themselves and their whole family. Our newspaper began publishing [a translation of] the immigration law, but since our readers did not appreciate its value, we suspended its publication. If and when our Jews from Turkey request it, we will resume publishing it or will issue it as separate booklets. The article then summarized Capelouto’s May 23 arrival, his questioning at Ellis Island, and his response about polygamy laws. …Based on American law, which excludes anyone who could potentially have many wives, they refused him. He was scheduled to be sent back on the 5th of this month. One can imagine Gabriel Capelouto’s sad situation, being cast out without knowing why. He has been detained at Ellis Island for 15 days. Finally, our editorial office learned what was happening to him and wasted no time in doing everything possible to attest that he is a Jew rather than a Mohammedan, and that he is married under the Law of Moses, which does not allow a man to take many wives. The necessary steps were taken in Washington and we are doing everything in our power to free him from this sad circumstance and prevent him from being sent back. After speaking with Mr. Capelouto personally at Ellis Island, we understand that his lack of knowledge of immigration law is why he now finds himself in tears and despair. Immigrants who have been turned away at Ellis Island. From Edward A. Steiner’s 1906 book On the Trail of the Immigrant. Thanks to online census documents and other records, we know what happened next: Gabriel Capelouto (later known as Gabriel Capeloto) and Sinoru (“Sadie”) were admitted to the country. They settled in Atlanta in the 1910s, moved to Tallahassee in the 1920s, and had a total of six children. Gabriel lived into his nineties and died in 1971. Ignorance of the law was just one cause that La America blamed for Sephardic immigrants’ troubles in the United States. Another was their widespread use of Gentile-sounding names instead of their Hebrew names, making it hard for Jewish aid societies to identify and help them. A 1912 article in La America, after summarizing the Capelouto case again, told the tale of Marco Capsuto (no direct relation to me, as far as I know). The “Oriental Bureau” that the article mentions was a division of the Hebrew Immigrant Aid Society (HIAS). HIAS, which had previously focused on Ashkenazic refugees, added this office in 1911 to meet the needs of Sephardic and Levantine Jews. Another case occurred this week. A man arrived in New York under the name Marco Capsuto, and the Hebrew Immigration Society [sic] at Ellis Island never would have believed he is Jewish if not for its new Oriental Bureau, which vouched for him, and he was saved with help from relatives and others who knew him: Gabriel Moreno, Yitzhak Capsuto and M. Reyna. If he had come through under his Jewish name of Mordecai instead of Marco in the first place, he could have avoided the problem. There are many similar cases. Jewish institutions also tell us that our brothers from Turkey travel through many U.S. cities under entirely transformed names, making it impossible for branches or representatives of these Jewish institutions to identify them and help them with certain troubles they may face. Anyone who hides his nationality is looked down on by the entire civilized world! On the other hand, if he declares his Judaism out loud, he is praised and respected. Even if he works in a Christian place, if something bad happens to him, if the boss knows he is Jewish, he will notify the Jewish institutions! Americans love our Jewish nation, so there is no reason at all to be embarrassed to declare yourself a member of your true and great Jewish nation! We have also publicized cases in which some people would hide our newspaper carefully in their pockets, fearing that their bosses would see it and find out they are Jews, and that this might hurt their livelihood. These same workers later told us that an issue of La America fell out of their pocket and, red in the face, they retrieved it. But since the bosses could spot the Hebrew letters from a distance, they realized the workers are Jews. Instead of losing their jobs, as they had feared, it turned out the bosses were Ashkenazim whom our brothers could not distinguish from Americans, and they embraced them, took a keen interest in them and improved their situations! Since then, many of our brothers now wear symbols and pins on their clothes and neckties with Jewish letters on them as well as many Zionist symbols so they will be instantly identifiable as Jews. Lately we have seen supposedly intelligent young men complaining publicly because we sent our Jewish newspaper to them at their workplace, thus ruining their chance of being taken for members of another nation! But they do not need that, because not even a Christian will put out our Jewish worker if he happens to discover he is a Jew. If this does occur, we urge those affected to contact the Oriental Bureau, which will resolve these matters through the major Jewish institutions. But we know for certain that these are the mistaken imaginings of our fellow Jews, who fool themselves and believe their bosses do not know! Wherever you go, show clearly that you are Jews! A Jewish name in America brings honor! You will find jobs more quickly by showing that you are Jews! Carrying the newspaper La America in your hand is the best possible way to prove this! 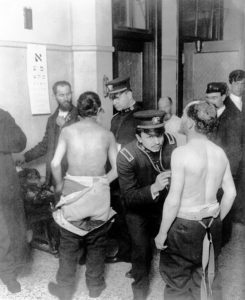 “Las sufriensas de nuestros djudios de Turkia en Ellis Island por no konoser las leyes de la imigrasion” [Our Turkish Jews’ suffering at Ellis Island for lack of knowledge of immigration laws], La America, June 9, 1911, p. 1. “La nasion djudia i nuestros ermanos de Turkia” [The Jewish nation and our brothers from Turkey], La America, January 5, 1912, p. 3. 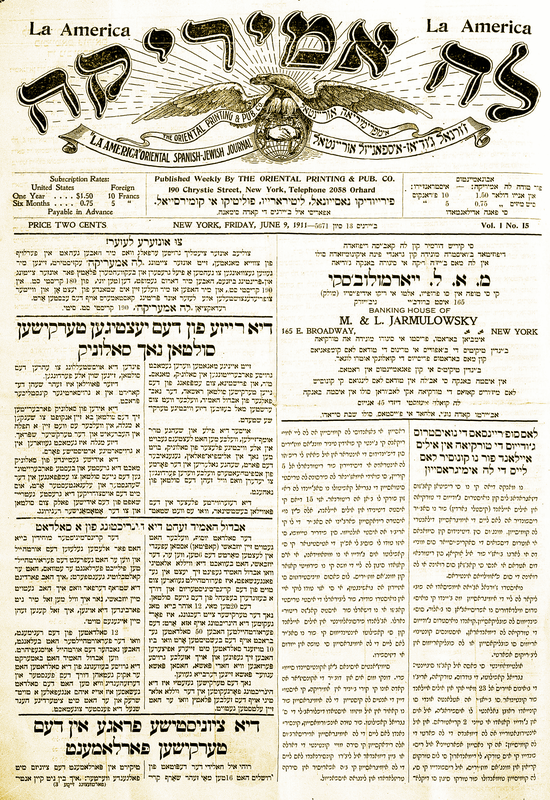 These and other issues of this newspaper are available on microfilm at the New York Public Library (Dorot Jewish Division), and online in full-text searchable form at the Historical Jewish Press website. Translations from Ladino © 2017 by Steven Capsuto. This entry was posted in Jewish immigrants in America, Jewish periodicals, Sephardic Jews, United States and tagged Atlanta, Ellis Island, Florida, Gabriel Capeloto, HIAS, Sadie Capeloto, Sinoru Capeloto, Sinoru Galanti. Bookmark the permalink.